R, 1 hr. 41 min. The promise it begins with doesn't pay off. And while "Arthur Newman" is not a complete disaster, it does leave you wishing the romance and the ride had been a whole lot smoother. Obviously the theme of "Arthur Newman" is the American dream of starting over, but Johnston's screenplay hits it so obviously that it loses its resonance. A strange film about dysfunctional people directed with good pace by Dante Ariola in his feature film debut highlighted by fine performances by Colin Firth and Emily Blunt. 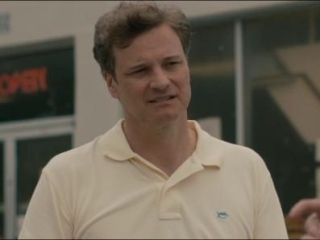 Academy-award winner Colin Firth seems to be doing someone a favor by agreeing to play Walter Avery/Arthur Newman. Ariola can't keep the proceedings moving forward, wallowing in the blue mood for far too long. It makes a decent movie with something to share about the exhaustion of defense mechanisms into a slog that leaves its actors high and dry. Firth and Blunt give life (and flawless American accents) to this restrained, and occasionally bland, road trip flick. Firth's performance alone would have been enough to hail this film by director Dante Ariola. Toss in an equally powerful performance by Blunt, and the film turns to a masterwork of acting. This is a decidedly minor effort, directed by Dante Ariola with a bland, generic eye, missing the pathos of interesting drama and the charm of quality romantic cinema. A slow, lethargic journey to nowhere, full of pseudo-profound dialogue and generic indie-drama plotting. 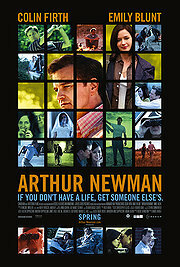 If anything, Arthur Newman is a reminder that some lonely people are lonely for a good reason. Without a satisfying finale, Arthur Newman might come across as just an acting exercise. If so, it's still an impressive one. Great performances from Firth and Blunt. Great characters and a strong script. Really enjoyed it, see it for yourself! Was surprised to see the negative buzz! Colin Firth and Emily Blunt were excellent, the story was fun. See it before you judge. No quotes approved yet for Arthur Newman. Logged in users can submit quotes. There are no discussion threads for Arthur Newman yet. One place for blockbuster features and news! Pretty self-explanatory here; HitFix offers up their favorite trilogies of all time. Feeling a little sappy? Here are 10 movie grooms who were left at the altar. From Twins to The Royal Tenenbaums, Moviefone explores cinema's oddest siblings. TimeOut lists the best movies about youth and rebellion. Rolling Stone boldly proclaims the rockin'-est moments in cinema. Log in with Facebook to share your reviews with friends, create a want-to-see list, and more!